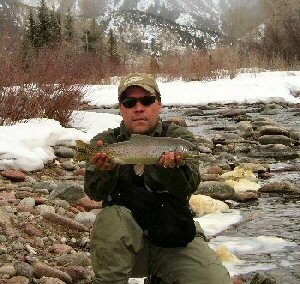 Roaring Fork River - Winter fishing. Although the Roaring Fork is a freestone river and therefore prone to freezing up high towards Aspen, from Basalt down it becomes fishable and productive even in the depths of winter. At Basalt where the Frying Pan spills into the Fork, water released from Ruedi elevates the temperature marginally when the weather is at its coldest. This supplements the water volume and contributes to reducing anchor ice and ice dams. Furthermore, as one moves down valley from Basalt, the river opens out so that the low winter sun will still reach the water more often. This assists in limiting ice as well as encouraging midge hatches. When the water is at it lowest, floating is not a viable option except down towards and past Glenwood Springs. Below Basalt the nymph fishing can be good at this time. As the ice breaks up and drifts down stream it will make contact with rocks obstructions and the river bottom, dislodging clinging and crawling nymphs from the surfaces on which they are located. The ice will also move over rocks shifting them revealing the nymphs underneath. As these types of nymphs are not burrowers or strong swimmers, they will tend to drift in the current until they are able to get a footing and relocate themselves. At this time they are vulnerable to any waiting fish. In addition as this is the time that the stoneflies are molting, it increases their vulnerability to the feeding trout. Always fish the nymphs as close to the bottom as possible. The fish lie on the bottom in the slower moving water. The surface water moves faster than the deeper water. Therefore the struggling nymph will tend to settle in the slower water to be taken by the waiting fish. The ideal fly in these circumstances is the tungsten 20 incher sizes #10 - #14. In addition, tungsten princes will also be productive. Midges work all year. In winter it is more comfortable fishing in the sun, and that is where it is more likely that a winter midge hatch will occur. We have prepared additional material on midges to which you may refer at your convenience. There are days when the Pan is not producing and our guides have taken the trip to the Fork with great results. Generally we suggest that the best part of the Fork at this time is below Basalt as the increased waterflow from the Pan supplements the flow in the fork. However we also have good result in Woody Creek when the sun can get onto the water. In addition, as winter proceeds, the small brown fry begin to hatch providing sustenance to the larger brown trout. In these circumstances streamers fished very low will work well. Recently Bob Gilmore, a local microbiologist and avid fisherman came into the shop looking for clousers! They worked well on the big browns emulating the small brown fry emerging from the bottom. The weighted eyes got the clousers down to the ideal weight. We have since ordered a range of clousers in the colors of browns, rainbows and brookies for the shop. bead head pops bugger olive #6 .